I had a small dinner gathering with friends the other night and wanted to make dessert. I only had about an hour to get home and start prepping/cooking though so I needed a quick and easy recipe. I found some small ramekins in the cupboard and wanted to make something to put in there. I thought something with peaches would be good and found this perfect recipe from Anne Burrell for peach crisps! It’s a very easy recipe- you mix all the ingredients for the peach filling and blend all the ingredients for the topping and assemble. I encountered a bit of an issue though while I was preparing it and was worried it wouldn’t turn out okay. I sadly do not have a food processor (who wants to buy me a gift?) so I mixed the topping ingredients in a blender. It usually blends well but I had a bit of a technical issue and it was not working well! (time for a new blender too) So I ended up mixing it with my hands and it turned out to be more mushy than crumbly. 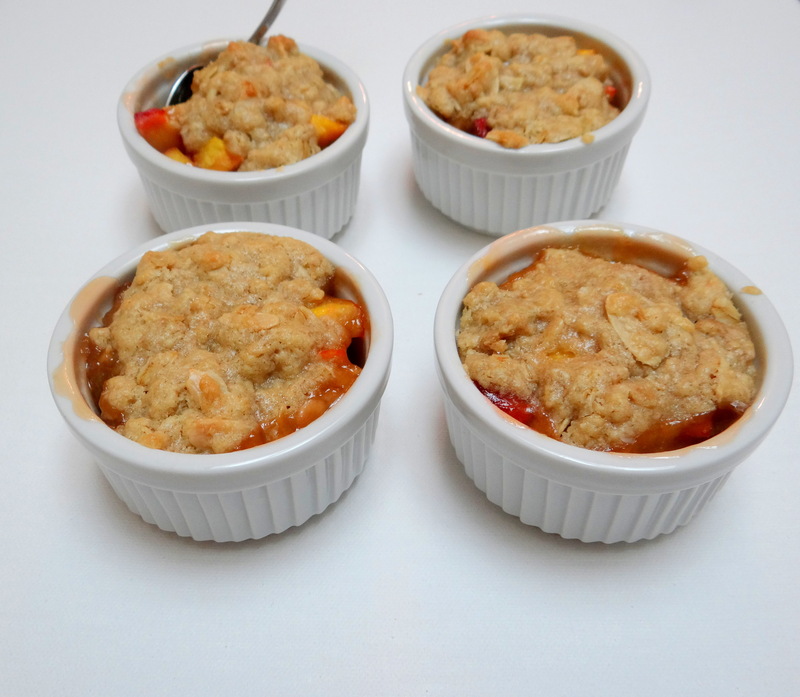 I spooned the peach filling into each ramekin and added the topping and hoped it would still turn out okay.. and it did! Mushiness and all! Toss the peaches in a large bowl with the zest and lemon juice. Add the rest of the ingredients and stir to combine. Divide the filling evenly between the ramekins. Top each ramekin with the topping. Be sure to loosely sprinkle the topping and not pack it down. The idea is to look very crumbly and craggy. Place the ramekins on a sheet tray and bake in the preheated oven for 20 to 25 minutes, or until the filling is hot and bubbly and the topping, brown and crispy. Next Postmy cute little breakfast: baked egg in a ramekin!